Several new graphics color the anticipated arrival of the Evoline 3 ST lineup: the Hakka, Century, Century HV and the Moovit. The upgrades of the Evoline 3 series include a new quieter design and improved interior ventilation, the easyfit system for use with glasses, and more comfortable interior with high quality washable fabrics, all can be viewed at Shark Evoline 3 ST. The Shark Evoline 3 Hakka graphic is offered in two versions, in matte white/black and gloss white/black/red. 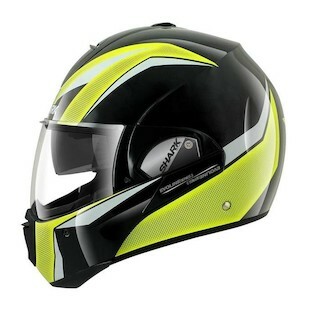 The design hints at masked bandit motif and the gloss version has a distinctive red line at the chinbar. It's simple, aggressive stance makes it one of our favorites. The Shark Evoline 3 Century graphic is more subdued than the Hakka and is available in three colorways: matte black/white/anthracite, matte black/orange/anthracite and white/brown/blue. Subtle texturing in various sections of the helmet make this a refined choice. 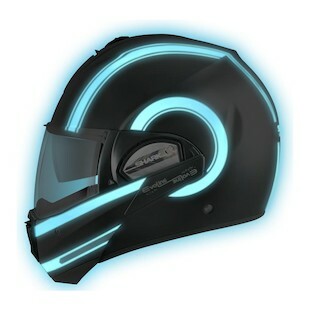 The Shark Evoline Century Hi-Viz adds this great high-viz graphic to the lineup for the safety conscious rider. In addition to the fluorescent yellow accents, there is a crosshatching of light silver/white metallic-flaked etching bordering several portions of the design. The Evoline Moovit graphic, with stellar orbiting accents lines, comes in matte black/orange and white/black/silver. Another offering in the same graphic is the Evoline Moovit Lumi that uses luminescent paint to make it glow in the dark and guaranteed to make you visible at night. All these options make for the most exciting generation of Evoline so far! 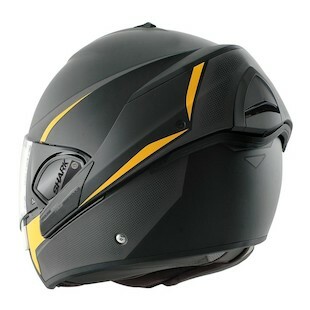 As always you can find them at RevZilla.com.